It's something new from the National Weather Service and is centered around keeping you safe on the road this winter. They're called snow squall warnings. Snow squalls are intense and narrow bands of snow. Basically - you go from a light snow shower all of the sudden to near white out conditions. That's a bad combination when you're driving. The image below shows a 35 car pile-up in 2013. It was the result of a snow squall along I-70. Mike Ryan, a meteorologist with the National Weather Service, says he hopes this new alert helps in, "Highlighting the greatest threat for dangerous driving conditions within the area where that squall is moving in. Where we may see near white-out conditions. Snowfall rates on the order of 1-2" per hour. Wind gusts over 30 mph. All of those things that can create significant problems on the roadways." 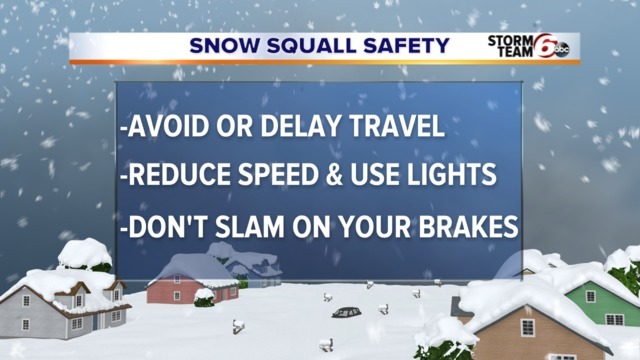 When a snow squall warning is issued for your area, it's best to avoid or delay travel if you can. If you're already on the road, reduce your speed and make sure your lights are on. Also remember not to slam on your brakes.